PBA 4th Time MVP June Mar Fajardo scored 22 points, on 9-of-12 shooting, to lead Gilas Pilipinas, while Jayson Castro added 15 points. Terrence Romeo and Andray Blatche chipped in 14 and 13 markers, respectively. Gilas was flat to start the game while Chinese Taipei got off to a hot start, establishing an early 12-4 lead. The Philippine team made a 7-2 run to make it a one-possession game, but it was the home squad who took the advantage after the first quarter, 19-16. A June Mar Fajardo layup to inch Gilas within six, but Cheng-Ju Lu made a triple to extend Chinese Taipei's lead to nine, 30-21, with 7:21 left in the second period. But Terrence Romeo answered with a three-pointer of his own to cut the lead back to six again. After a few back-and-forths, Gilas was able to tie the game at 33-all after a fastbreak layup from Romeo. Chinese Taipei answered with a trey from Yi-Hsiang Chou before going on a dry spell as Gilas uncorked an 8-0 run -- all coming from layups -- to take a five-point edge, 41-36, 1:37 remaining in the half. After a free throw from the home squad, Matthew Wright knocked one down from beyond the arc to put Gilas on top, 44-37, at the half. Gilas remained in control of the game in the third and went up by a baker's dozen, 60-47, after a layup from Castro at the 4:50 mark. After a few possessions, two triples and a dunk from the Chinese Taipei squad pulled them within six, 66-60. Norwood hushed the crowd with a baseline jumper to keep Gilas in front, 68-60, heading into the final frame. The momentum remained with the Philippine team as they extended their lead back to 13 points, 74-61, after a three-pointer from Wright. A 5-1 run from Chinese Taipei trimmed the deficit to nine, 75-66, 6:30 left in the game. Both teams then exchanged baskets but a Romeo basket kept Gilas ahead, 80-69. Chinese Taipei had a tough time on defense as the Philippines kept its foot on the gas pedal, widening the gap to 88-71, two minutes to go, after two free throws from Pogoy. Then Norwood pretty much put the nail in the coffin with a three-pointer on the next trip down to give his team a 20-point lead, 91-71, sealing the game for Gilas. - Chinese Taipei assistant coach Charlie Parker on Thursday said he was concerned with the support Filipinos in Taiwan will show for Gilas Pilipinas. True enough, almost a quarter of the Heping Gym comprised of Filipinos, some who even bought tickets from scalpers at a higher price just to see Gilas play. 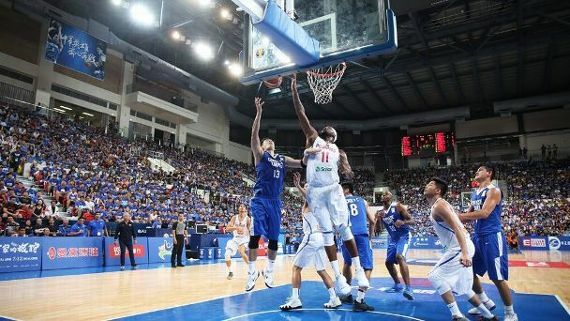 - In the other Group B match, Japan shocked Australia, 79-78. Chinese Taipei and Japan will meet next to determine which team will advance to the next round.